"I want diamonds!" Miss Bunny says. Diamonds! Diamonds! And I don't mean rhinestones! 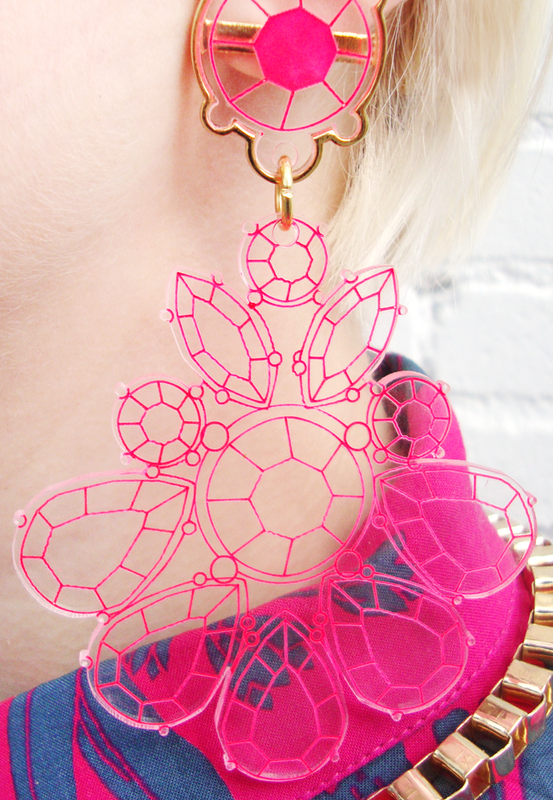 My maxim when it comes to earrings: The bigger the better. Feeling quirky today, I like! 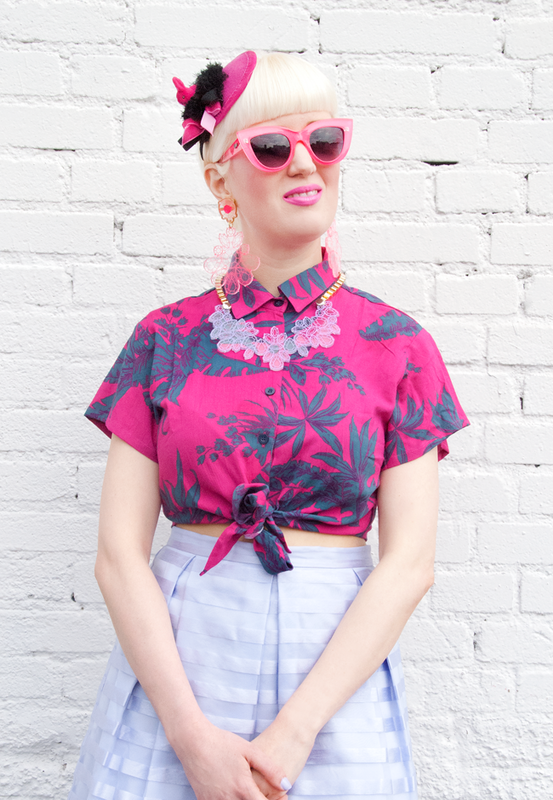 A touch of vintage is always included with cat eyes sunnies. Isn't this the most adorable bunny you've ever seen? A dream come true: Kanokkorn Lamlert's perfect creation on my neck. 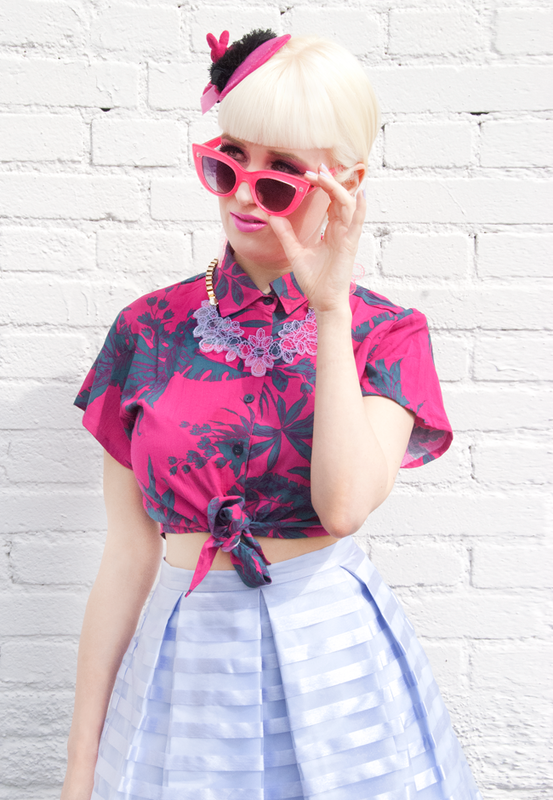 Tropical prints and stripes: Come on baby, let's mix patterns! You say I look like a pink Christmas tree? Hohoho! 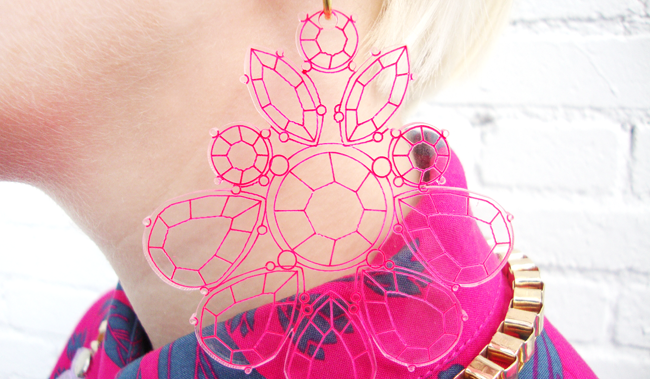 If perfection lies in the details, this earrings are just divine! Let's end the look with Lagerfeld's ice cream, wouldn't we? 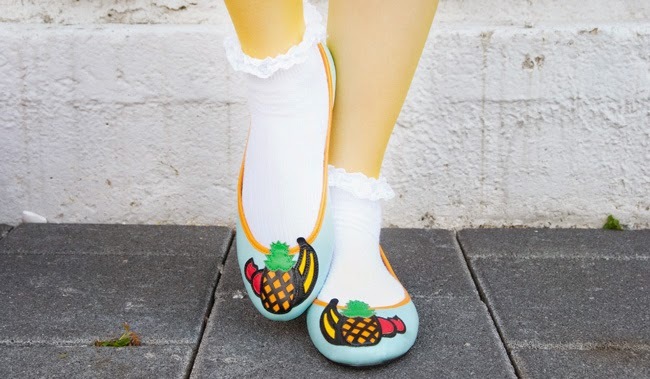 Quirkiness, what a magical word in my ears! The days I wake up, look in the mirror and think "Gosh, I feel sooooooooo quirky today!" are by far my favourite days. I feel creative, when I dress quirky. The liberty of expressing myself with my looks is dear to me – I think quirkiness is the word that should be written on top of Maslow's hierarchy of needs. It's the ultimate form of self-fulfilment! Call me crazy, but sometimes I can't sleep because my mind won't stop creating new looks. The crazier they are, the more happy they make me and I think I just begun. Fashion is the icing on my cake. Eat the cake, never stop to love fashion! I feel like a queen today, wearing jewellery from Thai designer Kanokkorn Lamlert. Since I saw her unique pieces for the first time, I knew that my inner magpie wouldn't rest until I have some of them. They look even prettier in real than on the pictures, I can tell you. The details are amazing and I truly adore the colours and shapes. You all know my fondness for Asian designers and Kanokkorn is an especially rare pearl among them. Wearing Lagerfeld shoes makes me think about Karl. He's got his Choupette, I have my pink bunny. 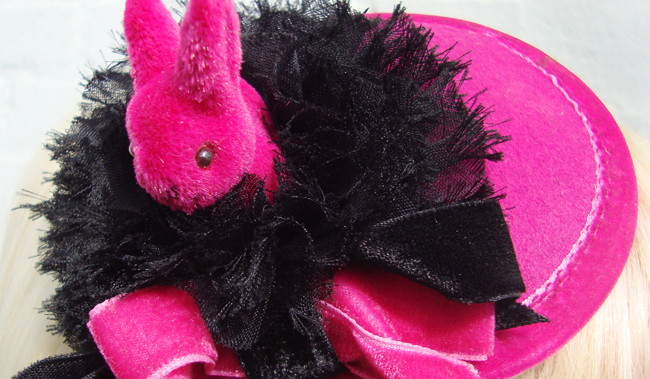 Jazzafine just knows what I like: A cuteness overdose in pink. I declare Easter for the whole year, bunnies just can't be restricted to a few days of the year! Thanks a lot to all the amazing designers out there who make my quirky dreams come true! 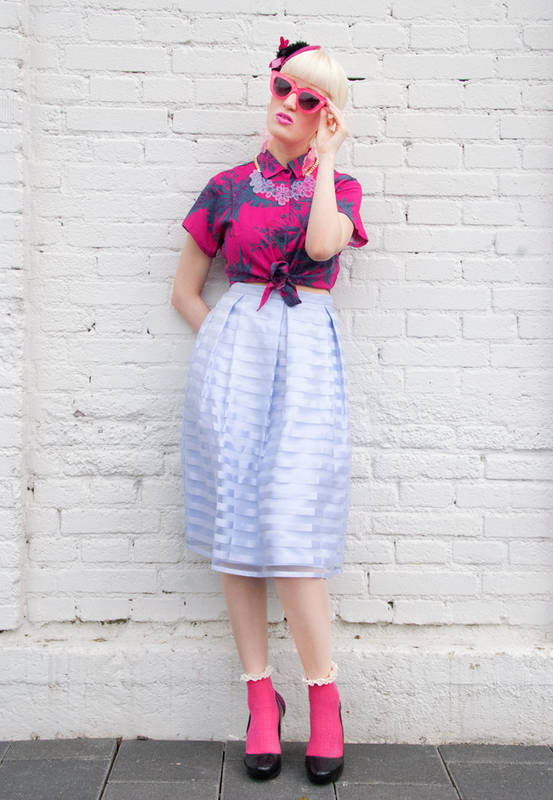 Now I'm curious: What is your quirkiest outfit and can you beat me in quirkiness? Thanks a lot Kanokkorn Lamlert for the jewellery and to Jazzafine for the fascinator. After their punk inspired "Broken Dolls" Collection, Spanish label Yiddish Chutzpah returns to absolute cuteness. 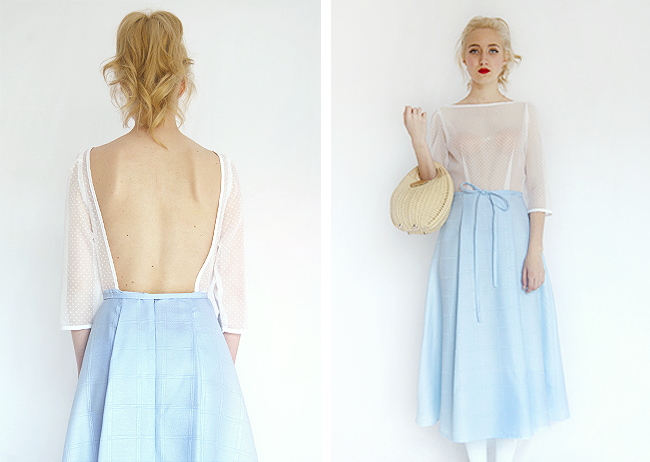 "Sweet High School" is the theme of SS14 and it awakes nostalgic memories of 90s high school movies. The shapes of the clothes have a touch of vintage and the designs are utterly darling but never come without a hint of naughtiness. Just like the prettiest girl at high school, who is knowingly attracting all the boys, but looking absolutely innocent with her angel face. The collection is a teenage dream for grown up girls, who perfectly know about the effect of how they dress. Scandalously translucent fabrics meet cute collars, skirts in a decent length for convent schoolgirls are combined with daring necklines, all in dreamy pastel colours. Don't forget to wear knee socks to this look for the perfect girly cheerleader look! Two of the styles are inspired by Spanish blogger "My Name Is Peggy Sue", the girl who probably owns the most pink dresses in the world. These styles especially caught my eye and I wish they would be inspired by "Sara is in Love with…" or at least be part of my wardrobe. Sweet dreams are certainly made of love from Spain and come from Yiddish Chutzpah! Shop the collection here and like Yiddish Chutzpah on Facebook. 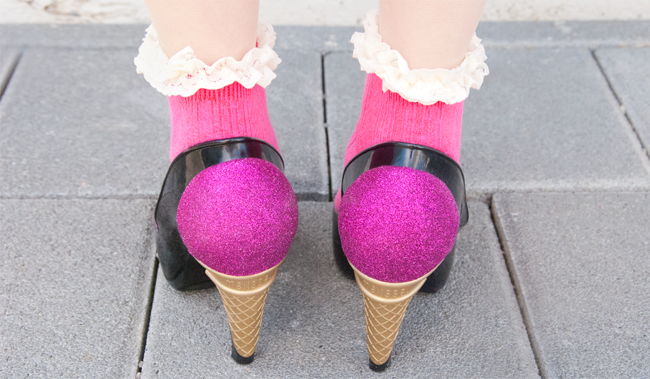 British designer Joanna Pybus is back and she brings ice cream with her, loads of ice cream. 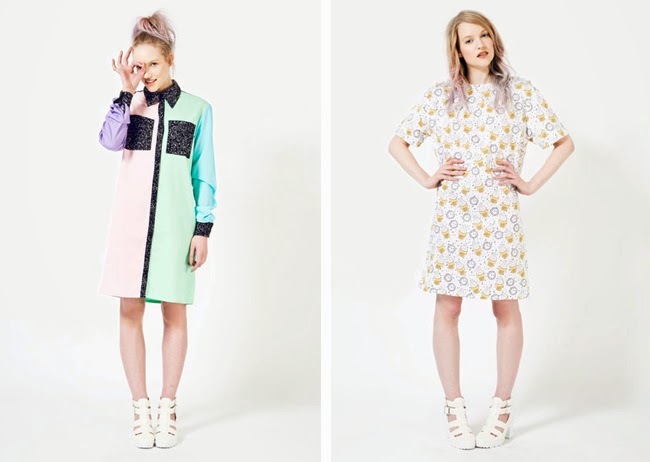 Joanna's SS14 collection is all in pastel sorbet colours, simple but flattering shapes and and she continues her tradition to make at least one new print for every collection. 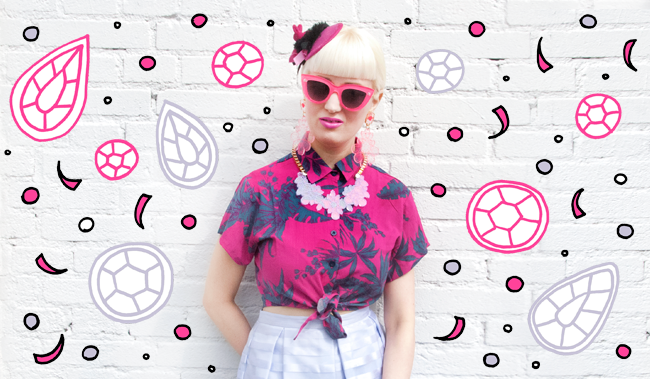 This season's called the "Ice Cream Time"print. Joanna's work is fashion made to cause happiness! She recently said in an interview, that her aim is to make fashion that speaks to the people on a personal level and I think that's just what she achieves. Her creations are a fresh and quirky breeze in a gray world and if you own a piece you want to treasure it like a beloved pet. Joanna continues her iconic range of furry monster clutches as well and added a few new styles, especially eye-catching among them the rainbow coloured one called Aurora (picture no. 3). If you are looking for something unique, you should have a look straight away at Joanna's page and get something all handmade by this amazing woman. What are you waiting for, it's time to go to the ice parlour! Visit Joanna Pybus here and don't forget to like her page on Facebook. 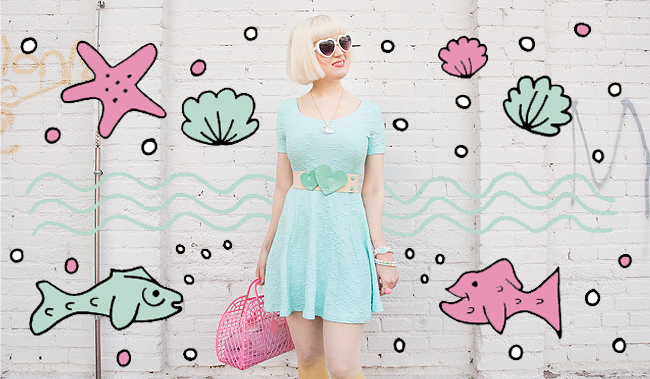 Today I feel like wearing mint – the colour of the sea and mermaid. The most beautiful shells must come from the deepest sea for sure. Like a journey on a dreamy sea, that's my look today. Just the bravest mermaids can dive to the deepest places where the most beautiful treasures are hidden. The song of the sirens might be the big temptations of the sailors. The thing I'm longing for the most is candy. Suddenly there are hearts all over, when I think about candy. Can you spot them? I bet you wanna dive into my pastel sea as well. Just come! If you are lovely, I might share my precious candy with you. Such a shame pineapples don't grow underwater! I think the mermaids would love them just like me. A rather plain style, compared to my other looks. No wild colour mix, neither pattern crush nor wild headwear. 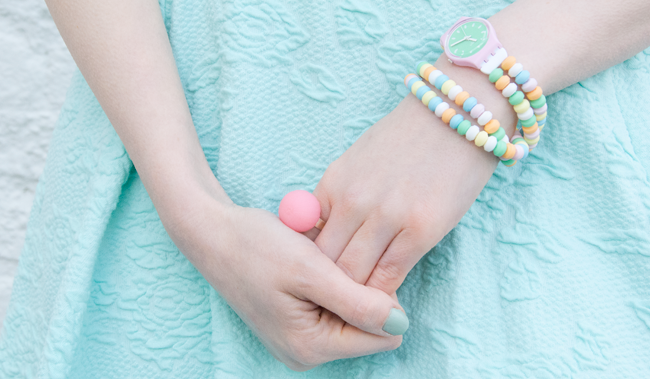 Just a sea of mint, the colour of swimming pools, mermaids and peppermint candy. This colour is like a fresh breeze in my wardrobe and I certainly could get used to it. I know a very lovely girl, who just wears mint and turquoise, with this outfit I start to understand why. I can almost sea a scenery of a fairytale underwater world in front of me, influenced by the look of my outfit. For the first time in probably ten years I'm wearing a watch. I am certainly no watch girl and use it merely as an accessory. If somebody asks me for the time, I'm just too used to grab for my phone. I dislike the look of most watches and can't understand the almost magical prestige many people see in them. I don't believe in big labels neither, they just don't impress me. 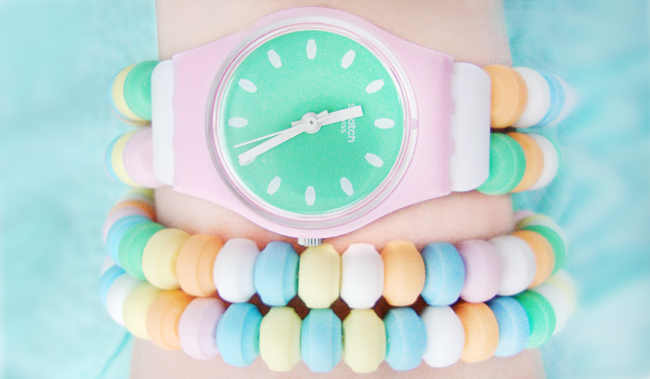 I like what visually appeals to me and trust my taste: Caramellissima from Swatch, the watch that won my heart. To me, this watch is somehow ironic: Among all the pieces made of gold and fine metals, decorated with diamonds, I choose candy! It feels like a rebellious thing I can tell you. Imagine me sitting in the train among a group of business man with their expensive timepieces. A friendly smile on my lips, but a sweet mockery on my wrist. 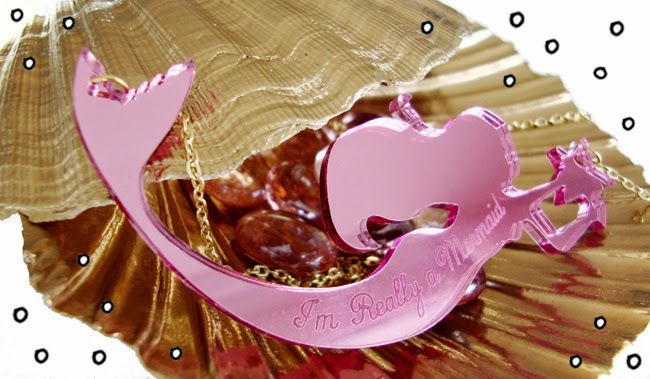 Forget about status symbols, candy rules my mermaid world! How do you like this look and what's your opinion on wearing watches? 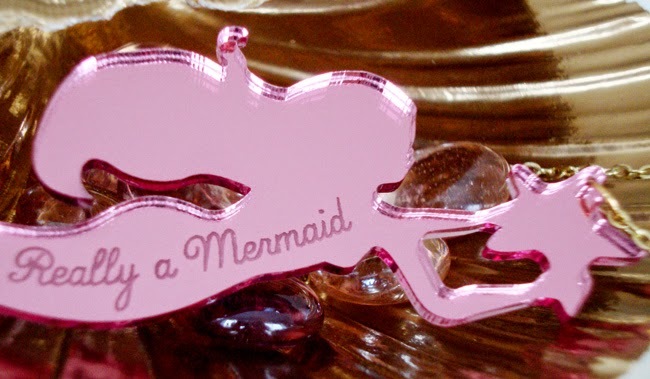 I'm really a mermaid and you can win me. With a little bit of luck I'll swim into your letterbox very soon. I'll bring my star with me and will love to be always on your neck. Because you are the loveliest readers I could wish for, I am excited to host another give away for you. I think this one is very, very special. 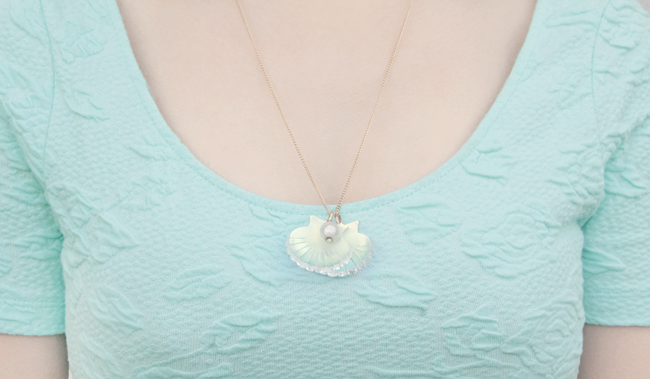 What could be better than a mermaid necklace? Nobody can resist the charm of this mystical sea creatures. 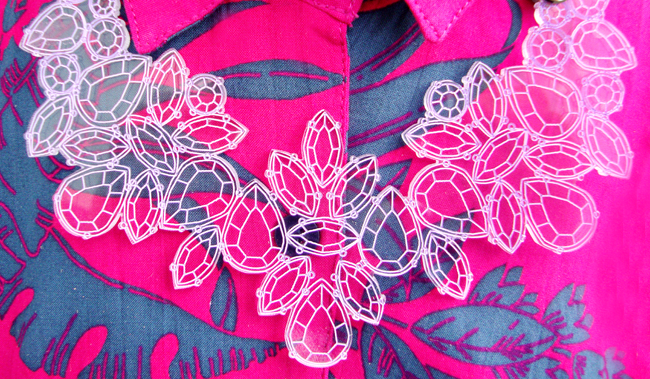 The shiny pink perspex necklace is from "I Love Crafty", the shop of British designer Laura Hunter. 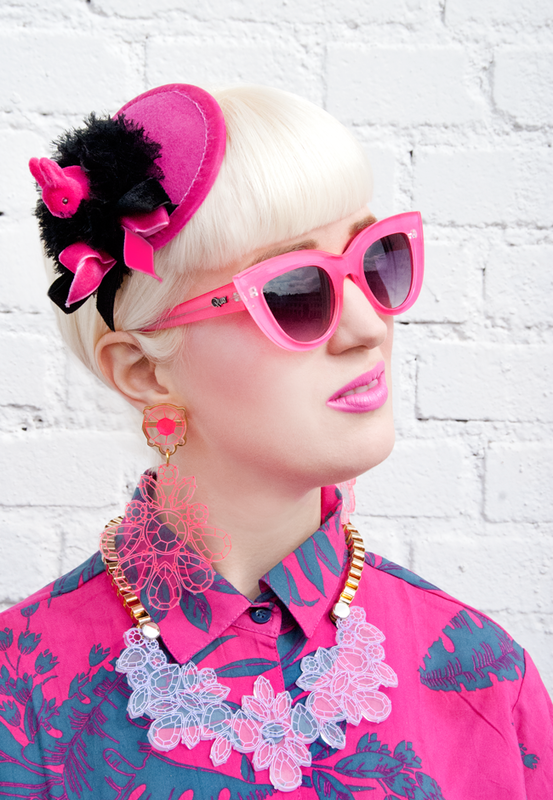 Laura makes unique jewellery inspired by cotton candy, day dreams and old kitsch movies. 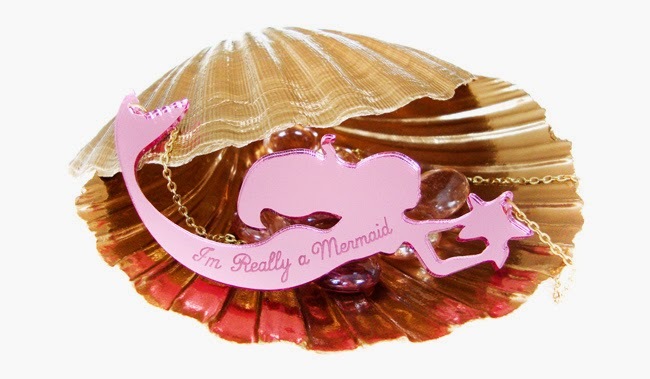 In her shop you will find the most awesome fruit based necklaces, feline designs for all cat lovers and as well this mermaid necklace and her pretty sisters. Probably you spotted ILC jewellery in my posts before, so here is the opportunity to follow my style council. 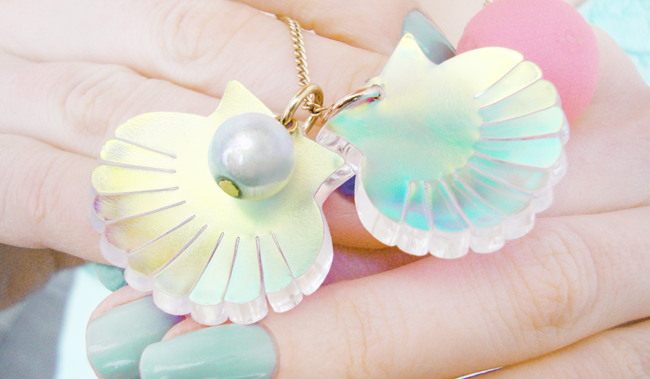 Very soon the mermaid might swim into your life and be the perfect addition to your pastel looks. I'm keeping my fingers crossed for you and wish you a lot of luck. The giveaway is open worldwide and starts at the 4th of May. It closes at the 31th Mai midnight CET. - Leave a comment on this post with your mail address. Please use the Rafflecopter to confirm your entry. There are a few more entry options to gain extra chances.